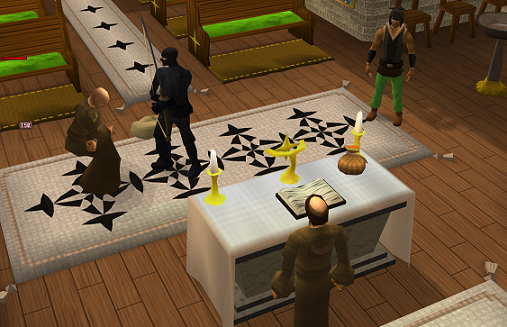 A monk outside the Paterdomus Mausoleum is in need of assistance so that he can attend an important ceremony. Can you help him with his task? Begin by speaking to the Monk near the Paterdomus Temple west of Canifis. Quests: Doric's Quest, Troll Stronghold, Wanted! 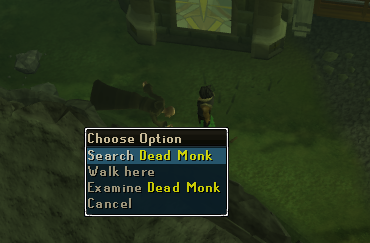 You can start this quest by talking to the Monk near the Zamorak church on the path towards Canifis (east of Varrock) on the Salve River. He will ask you to bring a Mithril 2-Handed Sword to Doric's place, and thin it down so you can string it. Once you get to Doric's place (north of Falador), you can make a Mithril 2-Handed Sword if you don't already have one, and use it on Doric's Whetstone. It will become a thin-blade, now use a string with it to make a Bow-Sword (this cannot be wielded). 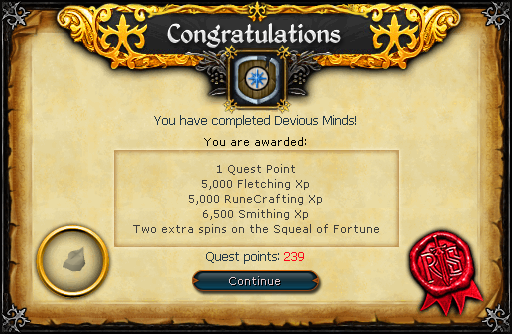 Note: Mithril 2H swords can be smithed using the Smithing skill. To do so, take three mithril bars and a hammer to an anvil of your choice. Doric's anvil is recommended seeing as you're going to have to go there afterwards anyways. You can also buy one from the Grand Exchange or the 2H sword shop in Burthorpe. Now head back to the monk and give him the Bow-Sword you made. He will thank you then ask you to do him a little favor. You have to smuggle the orb onto Entrana. You need to head back to the Monk from the beginning. Upon finding him you will see that he was killed "by some powerful magic." Head to Entrana and inform the Head Monk. He will tell you to inform Sir Tiffy Cashien of this. Sir Tiffy can be found in Falador Park. Once you tell him about what has happened, you're finished with the quest! 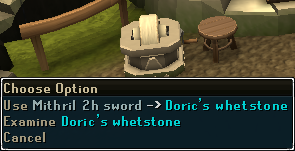 [^] Use Mithril 2h on Doric's Whetstone. [^] Put the Orb in a Large Pouch. [^] Head to Entrana via the Law Rift in the Abyss. [^] Go to the Altar. [^] Go back to Monk. [^] Inform the Head Monk on Entrana about what you have found. [^] Talk to Sir Tiffy Cashien.